Paddlers dug in at the start of yesterday's Koa Kai Laulima Regatta at Keehi Lagoon. Kaneohe has the Hui Wa'a regular season on cruise control. Now, the main thing is figuring out how to optimize crews going into the Hui Wa'a Oahu Championship and Hawaiian Canoe Racing Association State Championships. At yesterday's Koa Kai Laulima Regatta, the powerhouse AAA (largest size) club rolled to 73 points and its sixth overall victory in seven regattas this year. Coach Clint Anderson is content with getting anywhere from 14 to 20 crews geared up for the Aug. 2 state championships. Kaneohe has competed in the AA (middle-size) class in state competition in the past, but Anderson hasn't ruled out staying in AAA this year. "Right now we know what we like to do, with the crews situation," he said. "I think everybody did awesome today. I think we can get some improvement from every crew we have, and go from there. Every week's a new week." The goal now is trying to clinch the top Hui Wa'a seed entering states by accruing the highest point total in each event (for Ekahi Medals) and a guaranteed top-six lane berth. Manu O Ke Kai finished second among AAA clubs with 55 points. The Waikiki Beach Boys, the class of the AA (middle-size) division, won handily with 58 points over 42 from runner-up Na Keiki O Ka Moi. Kumulokahi-Elks edged Ka Mamalahoe in the A (smallest) division, 17-15. 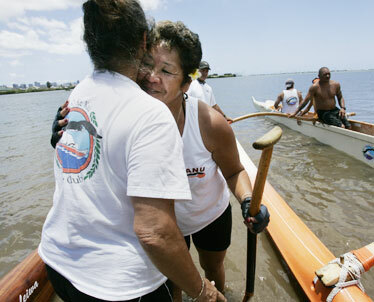 Sundra Ornellas, right, a member of Manu O Ke Kai Canoe Club, mixed platinum 60's crew, got a hug from Marilyn Schoenke after they won their race. Hey, if Rafael Nadal can beat Roger Federer on grass, why can't Manu O Ke Kai beat Waikiki Beach Boys at Keehi Lagoon? Week after week in Hui Wa'a, the two crews have watched each other celebrate hard-fought victories in the men senior event, with neither able to gain a foothold over the other. With their point totals in that event tied at 24 entering the day, Manu O Ke Kai took a big step toward erasing that pattern yesterday at the Koa Kai Laulima Regatta at Keehi Lagoon. The two crews had alternated victories in the prestigious race in every regatta since the season started in May, with the Beach Boys dominant at Keehi and Manu unstoppable everywhere else. But the club from Haleiwa earned an important "road" victory by a margin of more than 10 seconds, at 11 minutes, 19.33 seconds over the Beach Boys' 11:29.80. It lifted Manu to a 29-27 points edge overall with only the Hui Wa'a Oahu Championships on July 19 left to decide the winner. The Beach Boys still have a good chance to claim the league's top seed at the Hawaiian Canoe Racing Association State Championships next month. The team needs to win on the day of the Hui Wa'a championship, an honor that earns a tiebreaker. But Manu is confident with the current lineup, which has carried it to two straight wins for the first time this season. Coach Moku Sanborn (also the steersman) couldn't put his finger on exactly what the difference was, suffice to say that the crew of Jason Bellefeuille, Bonga Perkins, Tomas Schlotman, Greg Pavao and Glenn Williams is exactly where it needs to be in the boat at the right time of the year. "Usually when they beat us, they beat us by a lot. Last week we beat them by a lot," said Sanborn, 39, who has been with the club since he was 10 years old. "It's a chess match, actually. You try to see what's going to make the boat run faster, what's the combination you're going to use. They're doing the same thing -- each week we're looking at it, there's different guys." All of Manu's core men senior crew members are avid one-man paddlers, an edge that Perkins, at the 2 position, was thankful for in their wins in rougher conditions away from Keehi. "We all know how to flow with the choppy ocean -- it helps out a lot," Perkins said. "Nothing to take away from the Beach Boys, it's been a battle. We had to step up our game in Keehi Lagoon, because this is where everything counts and this is where the states are. Not Waikiki, not Haleiwa, not Kailua. Right here, this is where all the records are made." Beach Boys men's coach Patrick Spitzer had likewise been experimenting with lineups from week to week, sometimes out of necessity. But he's hesitant to make drastic moves now, despite what might be considered a must-win type of situation in two weeks. "Our boat didn't blend as well as we could have," Spitzer acknowledged. "We had some moments where it was up and running really well, but most of the time there's at least one little mistake being made. Over a mile-and-a-half race, that adds up to a couple of boat lengths pretty quickly." He still gave a nod of respect toward the Manu O Ke Kai tent, where success was often had in last year's men senior events, as well. "Manu's fast and they're always really solid. If we're not on our best game, then they'll pull it out," Spitzer added. Two of Manu's regulars in the crew are new to the club this year. Bellefeuille and Pavao came over from Na Keiki O Ka Moi for regattas after a long association with Manu in distance-only events. Once again, the one-man factor was praised for building success. "That's one of the good parts about it, you can jump in any other crew and you can jell with the crew, no matter who you are," said Pavao, 46. "That's one of the advantages that we have, especially last week how rough the water was (at Maili Beach). All one-man paddlers, we could just roll over that slop." Now they proved they can win where it counts, too. » Thousands honor the "people's mayor"